Aim and Objective: The development of small molecules that can interact with key therapeutic target represents an active field of research. Therefore, new approaches for increasing the molecular diversity of a starting material, such as a natural product, are needed. Herein, the carbonyl group present on a pregnane scaffold, or easily obtained from the oxidation of the corresponding alcohol, was used to obtain a series of diversified steroidal morpholinone derivatives. Materials and Methods: Using chemical synthesis, two levels of molecular diversity were introduced at position 20 of a C21-steroid scaffold. Nuclear magnetic resonance (NMR) spectroscopy and x-ray analysis were next used to characterize the morpholinone derivatives. Results: The C-20 carbonyl of pregnenolone was first transformed into an oxirane that reacted with an amino acid and the resulting amino alcohol was then cyclized to generate different spiro-2-morpholinones. X-ray analysis of one representative compound confirmed the 3-dimensional representation of this new family of diversified steroid derivatives. NMR analysis supported the expected structure and identified key markers of the chiral center configuration found in the 2-morpholinone moiety. Finally, the NH of the morpholinone ring was alkylated, thus increasing structural diversity. 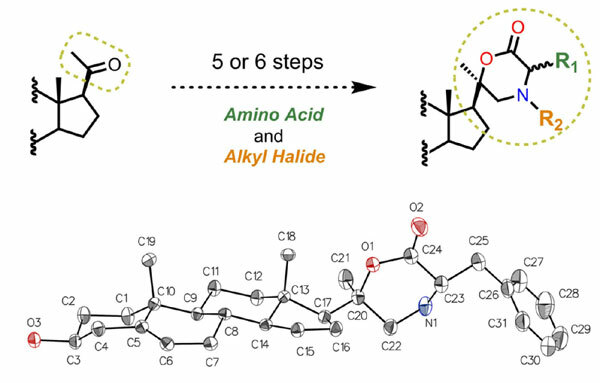 Conclusion: Considering the huge amount of building blocks (amino acids, bromobenzyl derivatives and ketones) that are commercially available, the strategy reported herein opens the door to the synthesis of diversified libraries of new compounds. Steroid, pregnenolone, oxirane, aminolysis, molecular diversity, Nuclear Magnetic Resonance (NMR).